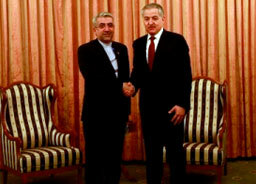 DUSHANBE (Avesta news agency) — Minister of Foreign Affairs of the Republic of Tajikistan Sirodzhiddin Mukhriddin met yesterday in Dushanbe with Iranian Energy Minister Reza Ardakanyan (رضا اردکانیان). As the information department of the Ministry of Foreign Affairs of Tajikistan specifies, Reza Ardakanyan arrived in Dushanbe to participate in the international high-level conference the International Decade of Action "Water for Sustainable Development, 2018-2028". During the conversation, the sides discussed issues of bilateral cooperation and stressed the importance of trade and economic development within the framework of the intergovernmental commission of Tajikistan and Iran on trade, economic and cultural cooperation.